Wood is a unique building material, but it undergoes deformation and decay that may lead to violation of the integrity of the whole structure. But don't worry because modern construction techniques allow for the replacement of destroyed parts of the wooden log house. As a rule, are subject to destruction logs under the Windows, the lower crowns of log cabins, floor joists, and flooring. Renovation should start only after determining the cause of the disease and its extent. For this release the lower crown and the lower part until, until it gets natural soil. Don't get complacent, if the result of the external examination has found no traces of destruction of wood. The log needs to be tapped with a hammer that will allow to detect the affected area by the characteristic sound and the places where later will be installed temporary supports, jacks and wedges. To raise the frame, use any Jack with sufficient capacity, for example, train or car Jack truck. Depending on the construction of the Foundation frame should be raised in two ways. So, if the frame is mounted on intermediate and corner poles, then the Jack will be installed under a log. If the log stands on a strip Foundation, you should first identify weaknesses in the logs and do there holes like Windows, and then insert the lever, or the piece rails. The inner end of the lever is placed on a secure base. Directly the Jack is mounted under the outer. The recovery log should be done very carefully, observing the synchronicity. If you are using one of the Jack after you put one part of the house, you need to set the focus. Only after that can continue to rise in a different spot. 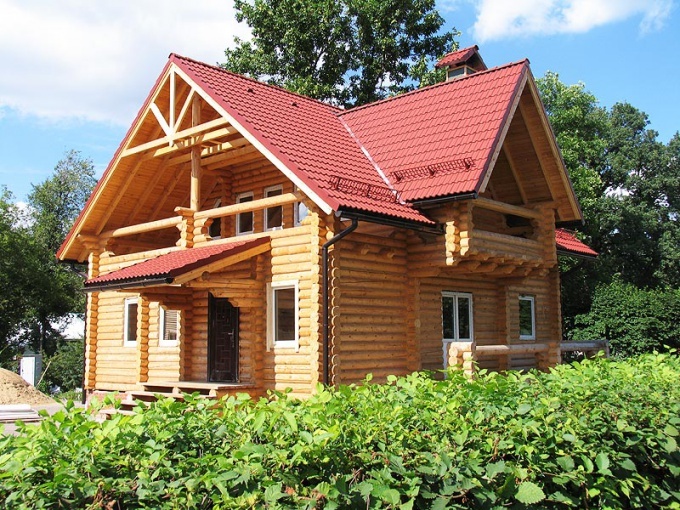 Experienced specialists strongly recommend inspection of the structures of log house in the fall and spring, carefully tapping and probing each log. Pay particular attention to the insulation, since this depends largely on the lifespan of wooden houses. Bath is a building that is regularly exposed to moisture, and such conditions lead to its rapid wear. To prolong the service life of the bath, and often to give her a second life, we need to strengthen the old Foundation or build new. To raise the bath if necessary you can own, the main thing - to comply with basic recommendations when lifting. Prepare everything in order to start lifting baths. The Jack must have a lifting capacity of 5 tons or more. Remove the corner bath in the bottom and install a stand for Jack. Suitable thick metal, timber of durum, a small concrete slab. Put the Jack on the ground under the wall, on top of him put a thick metal plate and begin to carefully Jack a corner bath. Once the angle is raised to the desired height, enclose under it on both sides of I-beam mounted on two supports a distance of about one meter, this beam will serve as a support for corner baths. After the beam is installed, lower the Jack and remove it. Dig under the corner of the bath pit for the Foundation to the desired depth, in various cases, it may be from 0.5 to 1 meter. Pour a Foundation of concrete and let it harden for two weeks. Once the Foundation will become strong, print a base of a bath of the material that is planned – it could be brick, rubble stone, logs, timber. Be sure to put a layer of waterproofing, if the base spread from a brick, or insulated layer on the bottom if you also enclose the tree. Put the Jack on the side of the flooded base of the pole and lift the corner of the bath so that the opportunity to remove its supporting beam. Remove the beam and slowly lower the Jack on the new Foundation. After done all 4 corners of the bath, safely installed on the new concrete posts, you can lay a brick or replace the logs in the old cap on the spaces between the corners. Do not forget to include a hole for drainage, otherwise your bath after repair again it will begin to break down. You can install with a Jack at the same time two corners on the supports and pour under them a Foundation, so the time work on the rise of the bath is significantly reduced.